Since Constitution Day(which was September 17th), Mark V. Tushnet has been blogging about both sides of the Second Amendment debate. See parts one, two, and three. 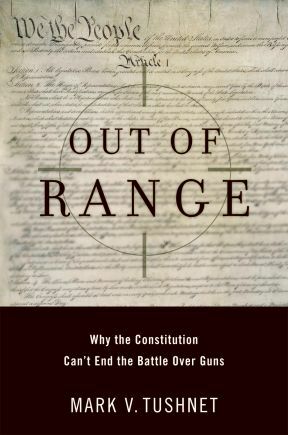 Today Tushnet, author of Out Of Range: Why the Constitution Can’t End the Battle Over Guns, concludes his series. He leaves us with an important idea: perhaps gun policy debates are missing the point. Keep reading to see what he suggests. The Constitution isn’t going to end our fights over guns because those fights are part of today’s culture wars. The position a person takes on gun rights and gun control says something about how that person sees himself or herself as part of the national community, and such self-understandings resist change. Supreme Court decisions and social science studies can’t push people from one way of understanding themselves into another way. If that’s so, is there anything we can do about our debates over gun policy? Public opinion polls suggest an intriguing possibility. On the whole, and of course depending on the precise question asked, polls indicate that overall we are less divided over gun policy than partisans and interest groups say we are. The basic picture is this: People think that it would be a good idea to have somewhat more extensive regulations of guns than we now have, but are quite skeptical about the prospect either of adopting such regulations or even enforcing the ones we already have more effectively. And that seems about right. The culture-wars dimension of gun policy means that we are basically stuck on the policy questions. The only regulations that can get through a law-making process strongly affected by the culture wars and the interest groups associated with those wars will have little or no effect on crime or violence. The sides managed to get together after the killings at Virginia Tech to enact laws making it easier for law enforcement agencies to get information about mentally disturbed individuals who might engage in gun violence. But no one should think that this new law is going to have any real effect on crime or violence. The problem, of course, is that gun policy has generated interest groups on both sides, who play important roles in generating financial support for candidates. The speech I’ve sketched would be met with opposition from the National Rifle Association and the Brady Campaign. Maybe, though, there are enough people in the center who would find candor on the issue of gun policy refreshing enough to give the candidate a real boost anyway. Or, at least, so I hope.